Dota 2 Lounge - What Happened to Item Betting? Dota 2 Lounge – What Happened to Item Betting? Dota 2 Lounge (Dota2Lounge / Dota2Lounge.com) was one of the premier sites for item trading. You could, and still can, go there and make a post with items you had and what items you wanted. Others would then see this listing and contact you to work out a trade. It was a great, free, and easy way to find others interested in trading items. It also functioned as a betting platform. Users could select a DOTA match and place a bet with their DOTA items. If said person lost, he would say goodbye to your items. If he won, he would get items back with a value equal to his bet winnings. In an example, if you bet $10 worth of items on a team with a 2 to 1 chance to win, and they won…you would get ~$20 worth of items back. The team at Dota 2 Lounge claimed they did not take a rake on this action until July 2016. Meaning, they’d give you a bit less than $20 back and keep a bit as profit. This is not uncommon with betting sites. This is how they make a profit. But Dota2Lounge says they did not start doing this until July 2016. Instead, they say they were making money from users donating in order to receive other perks (bumping item listings). In July 2016, Valve sent out a cease and desist letter to dozens of sites operating in the betting / gambling space. Dota 2 Lounge was one of those named sites. They did not immediately react to the C&D but did shut down their item betting operations in due time. As of the time of this writing, you cannot bet items on matches on dota2lounge.com. They did give all users 100 “coins” which do not have a monetary value. You are able to bet these coins. However, there is currently no way to obtain new coins nor cash out the coins for anything of value. The flat part of the line in the traffic chart at the top of this post has them within the top 8000 websites worldwide. In July, they spiked to the top 1500. We are not sure what caused this spike. We believe it was due to new ownership + marketing investment. 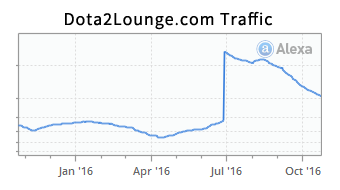 Then soon after, with the removal of item betting, their traffic started to drop. It is clear that many still use their site for trading. However, if they do not come up with a way to allow users to bet on matches, we believe they will continue to see a decline in traffic. What will they do? Work out a deal with Valve? Will they provide a way to buy and sell their “coins” and become a real-money betting platform, avoiding items / skins all together? Only time will tell. October 25, 2016 lootmarket DOTA Comments Off on Dota 2 Lounge – What Happened to Item Betting?